Become a wealthy Monopoly property owner. Knowing the key Monopoly strategies can help you win the game and become a wealthy Monopoly real estate baron or baroness. Monopoly is one of the most loved board games. It combines the fun of competition, the allure of real estate and the satisfaction of making money - all in one easy-to-learn and easy-to-play game. All ages can play together; so, it is a great game for families. This is also a good game to consider when you need a game to capture everyone's attention and liven up the atmosphere. Knowing the right strategies to employ can move you into the winner's circle, whether you play just for fun or enjoy the wild competition of a Monopoly tournament. Control a color group - Once you have all of the properties in the color group, you can start to make money by building properties and charging rent to your opponents. Keep your opponent from controlling a color group - Blocking someone from completing a color group could save you a lot of money in rent. Even though you might only own the one property in the color group, it may become a great property to trade. Buy the second set of properties on each side - There is a higher rent return on your investment than you would receive from the first set on the side. You can charge more rent, but the houses and hotels cost the same. Buy the orange properties - They have a high probability of being landed upon. If a player is in jail, they reach an orange property with a roll of six or eight (two of the most popular rolls). Buy railroads before utilities - Railroads are spread around the board, but there are only two utilities. Reading and B&O Railroads are visited the most and Shortline is visited the least. But if you buy utilities, be sure to buy both. Don't ignore low-priced properties. They are a smart investment because they are cheap to buy and the rent adds up quickly, particularly if you build four houses or a hotel right away. Develop popular properties - Reading and B&O Railroads, New York and Illinois Avenues are the most landed upon. Mediterranean and Baltic Avenue are the least landed upon. Don't sell houses - If houses are not available for others to add to their properties, don't sell any of your houses to upgrade to a hotel. It would give your opponent houses that could be used on a high rent property. Create a housing shortage - There are only 32 houses and 12 hotels in the game. The more you buy, the less the other players can buy. As soon as you have a Monopoly, build to three houses on all of the properties. If you do this with nine properties, you can tie up 27 of the 32 houses available in the game. Start building on the most expensive property of a color group - That property will yield you the most rent. 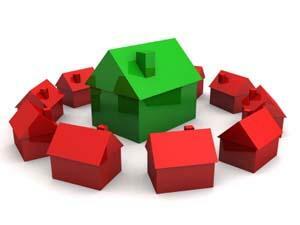 Quickly build to three houses - The rent increases significantly between the second and third house. Sit tight with three houses - There is not a lot of added income with a fourth house or a hotel. Don't buy the fourth house or hotel unless you have a lot of cash. Buy "out of turn" - Don't wait for your turn to buy houses and hotels. You can buy them anytime. Mortgage a single property first - Single utilities and railroads are good candidates for mortgaging. You can't earn any rent money so you might as well mortgage them for cash. Don't mortgage a property if you own two or more in the group - You won't be able to build on any of the remaining properties in the group; so, you won't be collecting any rent. Start mortgaging properties on the first street after "Go" - These have the lowest rental potential. Mortgage Illinois Avenue last - It is the property on which players land most often. Lift mortgages in the reverse order of mortgaging - This will quickly bring back the properties with the greatest rental potential. Choose the 10 percent option in the beginning of play - If you have to pay taxes, paying a percentage (instead of the $200 flat fee) makes more financial sense when your assets are low. Select the $200 flat fee option (not the 10 percent option) later in the game, when you have a lot of cash and properties. Plan your jail time - If you land in jail at the beginning of the game, do what you need to do to get out quickly. You don't want to be in jail when you could be out taking your turn, buying properties and placing houses. Later in the game, you might enjoy staying in for a few moves to avoid moving around the board and potentially having to pay big rents. Know the odds - Most players make a complete lap around the board in five to six turns. You can make better buy and build decisions if you know the probability of your opponents landing on each square. Keep track of the total money held by other players - It could be helpful information if there is an auction. Be a determined business person - Collect all rents owed. Build on a property if you can bankrupt an opponent. Amazon.com - They sell both the classic edition of the game as well as several specialty editions. The Monopoly Companion: The Player's Guide - A book with tips and strategies on winning at Monopoly. How to Win at Monopoly - An audio CD with tips on winning the actual game and applying the strategies learned to life situations. Everything I Know About Business I Learned from Monopoly: Successful Executives Reveal Strategic Lessons from the World's Greatest Board Game - A book with tips on how to apply Monopoly strategies to the business world.